Does anyone not like pralines? Made of sugar, butter, cream or milk, pecans, maybe a little vanilla: pralines are simple, straightforward, and satisfying. Aside from the zillions of pralines sold to tourists frequenting New Orleans’ French Quarter, they usually appear in the fall with the new pecan crop, or around the winter holidays along with the other festive sweets. To make a praline, the few ingredients go into a heavy saucepan to cook until reaching 239 degrees (the soft-crack stage). Next, the cook stirs a bit to cool the mixture slightly, then spoons out the candy. No need for a sous-vide machine, no liquid nitrogen, no sodium alginate or xanthan gum. Just dairy fat, sugar, pecans, heat, and time….and the creamy/slightly grainy, melting texture contrasted with crisp pecans is a delight. I like John Folse’s praline recipe, because he suggests toasting the nuts first. 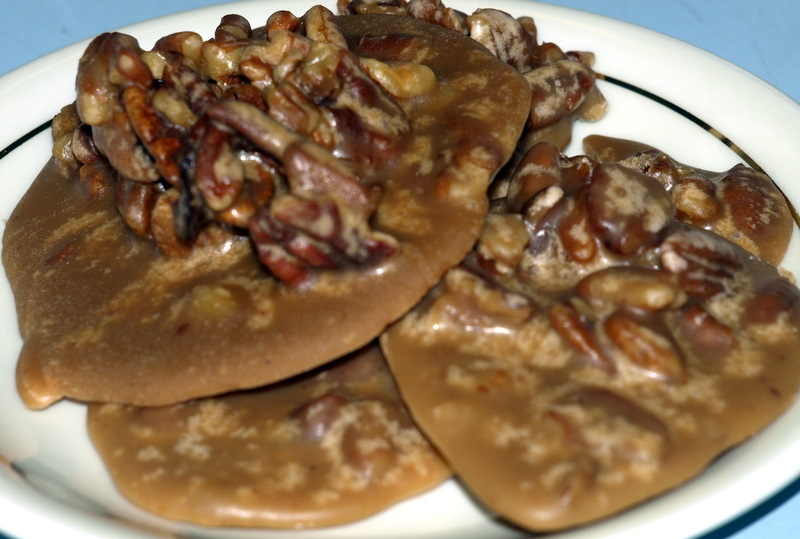 It deepens the pecan flavor quite a bit, and pralines made with toasted pecans keep a few days (i.e,. they don’t get grainy) longer than those made with untoasted nuts. Pralines are never out of season! !